Today we are updating the most renowned book for preparation for SSC. Hope it will add some fuel to our preparation.Link is provided below . 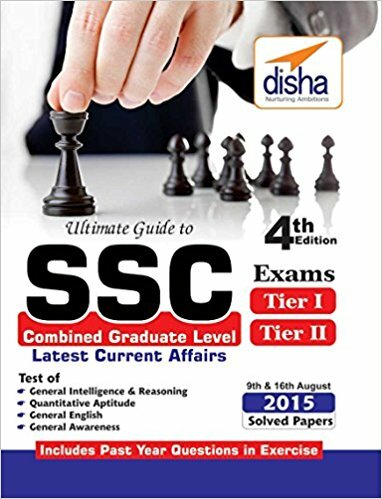 To help students in the preparation of CGL Tier I & Tier II Exams, Disha Experts have prepared the Ultimate Guide to SSC Combined Graduate Level - CGL (Tier I & Tier II) Exam 4th Edition. This book uses simple language and has numerous examples so that students get the complete understanding of the topics. The authors of this book have studied the syllabus and the framework for these exams and have ensured that the content is updated and is accurate. Published by Disha Experts, this is the 4th edition of this book. This book along with detailed description of fundamental topics, gives explanation on Data Interpretation and Graphs; Indian Economy, Computer Fundamentals and Comprehension. Plus there are separate sections on General Awareness which includes chapters on History, Geography, Polity, General Science, Miscellaneous topics and Current Affairs. It discusses various topics like Reasoning Verbal Reasoning , Analogy, lassification, Series, Coding-Decoding, Blood Relation, Direction & Distance, Ranking Test, Number Puzzle, Logical Sequence Of Words, Clock & Calendar, Venn Diagrams, Syllogism, Mathematical Operation, Arithmetical Reasoning, Matrix Based Reasoning , Statement & Conclusions Non-Verbal Reasoning , Cube & Cuboid, Completion Of Figure, Figure Formation & Analysis, Paper Cutting & Folding, Visual Reasoning, Mirror & Water Image, Embedded Figures, Non- Verbal Series Section 2: Quantitative Aptitude , Number System , Hcf & Lcm, Algebraic Expressions And Inequalities, Average, Percentage , Profit & Loss, Simple & Compound Interest, Ratio, Proportion & Partnership, Mixture & Alligation, Time And Work, Speed, Time & Train / Boat & Stream . Plus there are ample practice and solved papers which shed light on paper pattern and marking scheme. About the publisher- Disha Publication, one of the leading publications which provides books and study materials for schools, JEE Main, IBPS, Medical entrance, Government Entrance Exam, boards and various other entrance exams. They also specialize in offering AIEEE question papers, IBPS Bank PO practice workbooks, solved papers, mock test papers and study materials for AIEEE, IIT-JEE Main, NEET, AIIMS, AFMC, CAT, MAT, XAT, SSC, LIC, IBPS, UPSC, CTET and other competitive exams. Some of the widely read and popular books from Disha Experts include Current Affairs 2016 for Competitive Exams - UPSC/ State PCS/ SSC/ Banking/ Insurance/ Railways/ BBA/ MBA/ Defence and Comprehensive Guide to SBI Bank PO Preliminary & Main Exam.